Why Is A White Lion White? The characteristics of a lion is determined by genes, and it was found that white lions are the offspring of two lions who both carry the "autosomal recessive gene". It doesn't mean all their cubs will be white, but if they don't both carry this gene, there's no chance the cubs could be white.This also means a white female can't produce white cubs unless the male she mates with also carries the recessive gene (and vice versa). White lions are not albinos but are leucistic. They have pigment visible in the eyes (which may be the normal hazel or golden color, blue-gray, or green-gray), paw pads and lips. Blue-eyed white lions exist and may be selectively bred. The leucistic trait is due to the chinchilla mutation that inhibits the deposition of pigment along the hair shaft, restricting it to the tips. The less pigment there is along the hair shaft, the paler the lion. As a result "white" lions range from blonde through to near white. The males have pale manes and tail tips instead of the usual dark tawny or black. White lions were first recorded in 1928 and in the early 1940s. In 1959, a pride with two white cubs was seen near Tshokwane in Kruger National Park, but later vanished. 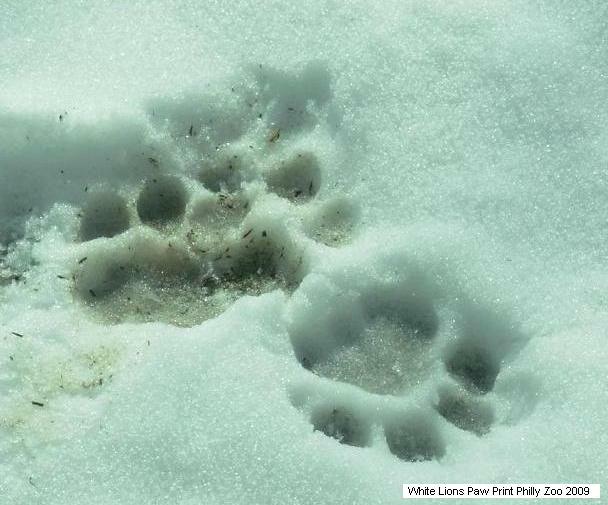 Albino lions had been recorded in the area according to David Alder ton's book "Wild Cats Of The World". In 1974, a light Grey lion cub was born at Birmingham Zoo, Alabama. Timbavati lion eyes are only a shade lighter than the golden yellow of a tawny lion`s eyes.White lions first came to public attention in the 1970s in Chris McBride's book The White Lions of Timbavati. White cubs occasionally turn up among tawny lions in the Timbavati and Kruger National Park regions. Because the gene is recessive and is masked by the normal tawny color, white lions remain rare in the wild and only occur when two lions carrying the mutant gene are mated together. The greatest population of white lions is in zoos where they are deliberately bred for color. The White tigers in zoos in washington,Delhi and i`m sure other places too. were bred from one white male tiger who was found in the wild,and was mated with his granddaughter and in turn with her offspring. Which has been a man - made situation. Which would never occur in the wild on any long - term basis because its not an advantage for a tiger - or a lion for that matter, to be white. Natural selection usually prevents brother ans sister lions from mating with each other in the wild.There is a white strain gene that makes a lion white,Only a few lions carry the white gene. In 1976 a white female cub was bornKruger and Umfolozi White Lions among a large litter north-west of Tshokwane; at about 2 years old her colour darkened considerably. In 1977, an aerial census of the Central District observed a white male lion approximate 2 years old and yellow-white rather than pure white. By the age of 4, this lion (which had formed an alliance with 2 other adult males) was also darker, but its tail tip remained buff rather than becoming black. In August 1976, a white female cub was sighted in another subgroup of the pride and belonging to a different lioness. She was named Phuma . She was part of a large litter that displayed a gradation of colour ranging from pure white, through pale blond to normal tawny. At the age of about 2 years, this female left the Timbavati reserve and was unfortunately killed. Her skin was later found for sale in a shop in the town of Sabi. This prompted concerns that Temba and Tombi would meet the same fate. As a result, McBride decided to capture Temba, Tombi and Vela (although tawny, Vela carried the gene for white). The cubs were taken to the National Zoo in Pretoria, South Africa where Temba produced several cubs before his death in 1996. In 1981, The white female produced a pure white cub which unfortunately died shortly after birth. Vela was sold and went to an unknown destination. It is not known whether Vela left any descendants, though the white lions in the Ouwehands Dierenpark (Netherlands) and a private South African Zoo appear to be from the Temba a Vela lines. Since the removal of Temba, Tombi and Vela, only a few white or pale cubs were born from time to time. One female lived for several years and was often seen hunting with her pride; she was killed in a territorial fight in 1993 and no white lions have survived since then. In 2003, the Global White Lion Protection Trust (WLT) initiated the first ever reintroduction of white lions to their natural endemic range - the Greater Timbavati region in South Africa. Preliminary results have shown that the hunting success of the white lion pride was comparable to or higher than the wild prides 'normal' coloured / tawny) of the Timbavati itself. This pride of "all" white lions has shattered the misperception that white lions cannot hunt successfully within their natural habitat due to a perceived lack of camouflage. The long-term objective of the WLT is to restore the natural balance by reintroducing an integrated pride/s of white and tawny lions within their endemic range. White lions are a unique contribution to the biodiversity of the region and are revered by the local communities that hold them sacred. The white lion population continues to be at risk, and captive breeding programs seek to keep them from disappearing completely. However, due to the small number of white lions available, there is a risk of inbreeding among close relatives, which can lead to genetic problems. Conservationists have attempted to mitigate this risk by breeding the offspring of captive white lions with regular tawny lions. White Lions are not legally protected in the wild or in captivity.They can be sold,traded and hunted into extiction. Through dedicated scientific study, the Global White Lion Protection Trust is working to have white lions classified as a rare variant or regional poly morphism of the African Lion, So that they may be formally protected locally nationally and globally. An Isle of Wight woman has launched an appeal to raise money to enable the tracking of five rare white lions about to be released into the wild.Karen-Jane Dudley is trying to raise �1,000 for the Global White Lions Trust in South Africa. Wants to fit the two adults and three cubs with radio collars before they are released in two months.White lions are a rare mutation of lion found in Timbavati, South Africa, where the charity will be releasing them. There are only about 300 white lions in the world, according to the trust.It has purchased its own land within the white lions' ancestral homelands of Timbavati since private reserves there still hunt lions as trophies.White lions are thought to have become extinct in the wild in 1994 and the Global White Lions Trust began reintroducing them into the wild in 2006.Ms Dudley said: "With the mortality rate for lions in the wild at 80% - only 20% survive to adulthood - the lives of this royal pride could depend on this radio tracking equipment. "The money raised... will be vital to allow us to know where they are and keep them as safe as possible. The team will sleep a lot easier knowing the young pride can be monitored day and night thanks to this equipment." Ms Dudley is also holding a photographic exhibition of her work with the lions to raise money for the Global White Lions Trust.It will will be on at Dimbola Lodge Museum in Freshwater Bay, on the Isle of Wight, until the first of March. Click Here: Karen`s Ghost of Africa Page. The white lions of Timbavati are not albinos and are a rare genetic strain of Panthera Leo. 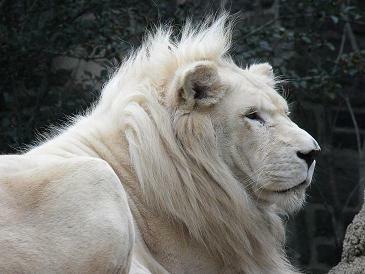 White lions possess a recessive gene. White lions have only been born naturally to tawny prides in the Timbavati region of South Africa. White lions survived successfully in their natural distribution range for at least 56 years � and in all likelihood, much longer. The Genetic Marker that makes white lions unique has not yet been identified by science. According to African mythology, the white lions are messengers of the gods. The belief is that showing disrespect for the highest creatures of creation will incur the wrath of the gods. This is in line with indigenous beliefs the world over. The International Union for the Conservation of Nature classifies lions as a vulnerable species, mostly due to habitat destruction and hunting.